The geopolitics of energy is undergoing significant changes, because the “oil weapon” has weakened; Israel has emerged as a natural gas producer; and the Paris Agreement on the environment necessitates a reduction in oil consumption. To take full advantage of the situation, Israel should be export gas to Turkey and Egypt, not just to Europe. Israel had an “oil problem” at birth. In 1947, the American oil industry lobbied against the partition of Palestine for fear of alienating Saudi Arabia. The oil embargo imposed by OPEC in 1973 seriously affected Israel’s international standing: Western Europe and Japan were now demanding a full and unconditional Israeli withdrawal from all the territories conquered in 1967, and nearly all African countries severed diplomatic relations with Israel. Energy resources are what enabled Putin’s Russia to pursue an aggressive foreign policy and to rebuild alliances with former Soviet allies (including in the Middle-East). Iran’s nuclear program was built thanks to Russian technology. Iran was able to conclude a nuclear deal with the great powers in 2015 partially thanks to China’s need for Iranian oil and natural gas. Energy has traditionally been Israel’s Achilles’ heel. Yet recent trends in the world energy market, as well as Israel’s emergence as a natural gas exporter, have transformed and improved Israel’s position. To fully benefit from the new geopolitics of energy, Israel must wisely leverage its natural gas resources vis-à-vis its neighbors, and play a leading role in the energy transition thanks to its technological edge. After the 1973 Yom Kippur War, the Organization of Petroleum Exporting Countries (OPEC) was able to blackmail oil importers and to isolate Israel because the oil market is cartelistic and because oil resources are geographically concentrated. The Middle East and North Africa generate over one-third of global oil production. OPEC controls about 80% of the world’s crude oil reserves and 40% of global production. This cartelistic structure has enabled OPEC to manipulate the prices of oil and thus to maintain political pressure on oil importers. Except for three low points (in 1986, 1993, and 1998), OPEC has maintained relatively high oil prices since 1973 (the record high was June 2008 with $156 per barrel). The nearly constant rise of oil prices between 1998 and 2008 was also due to increasing demand from China and India. Following the shock of the 1973 embargo, the United States initiated a policy meant to reduce its dependence on Middle-eastern oil. Four decades later, the United States has almost reached this goal and it is nearly energy independent. The “shale boom” (i.e. the production of oil and natural gas by fracking) has reduced US dependence on fossil-fuel imports (i.e. oil, natural gas, and coal) by 64% since 2005.1 Today, the US only imports 13% of its fossil-fuel consumption (a third of what it imported a decade ago), including from Canada and Mexico.2 The United States imports only 5% of its fossil-fuel needs from outside North America. As for oil, the US produces 40% of its domestic needs and imports the rest from Canada, Mexico, Venezuela, Nigeria, and the Persian Gulf. Persian Gulf countries (including Saudi Arabia) provide only 13% of US oil imports (i.e. 7% of total US oil needs).3 US reliance on Middle-eastern oil is therefore minor. The United States cannot be blackmailed by Middle-eastern oil exporters, especially since the US economy is expected to further reduce its oil imports over time. Since 2014, moreover, oil prices have plummeted (from $110 a barrel in June 2014 to $45 in August 2017, going through $30 in January 2016). The main reason for this decrease is Saudi Arabia’s decision, in November 2014, to flood the global oil market with the intention of driving-out fracking firms and of thwarting Iran. The fracking technology has significantly boosted US oil production and self-reliance. As for Iran, it rejoined the oil market in January 2016 as sanctions were being lifted. Yet Saudi Arabia’s gamble has failed, as the fracking industry has proved resilient, and as the increase in Saudi production did not affect Iranian oil sales (which, by increasing supply, contributes to low prices). The Paris Agreement on the environment, sealed in December 2015, compels signatory countries to reduce their carbon-dioxide emissions and, therefore, their oil consumption. This policy choice, combined with the structural changes explained above, make it harder if not impossible to manipulate the oil market for political purposes. This is good news for Israel, though oil will continue to be a central source of energy in the foreseeable future. At the time of the 1973 embargo, oil’s share in the global energy supply was 46%. Today, oil’s share is 31% (as opposed to 29% for coal and 21% for natural gas).4 The change is significant but not dramatic. Natural gas is emerging as a favorite source of energy, because of its abundance and relative cleanliness. Shale gas has turned the United States into a net exporter of natural gas in 2017, for the first time in sixty years.5 The global LNG (liquefied natural gas) market is growing by 4-6% per year, LNG is the fastest growing way of trading gas, and LNG demand stands at about 265 million tons per year.6 Therefore, Israel’s natural gas resources turn out to be an economic and geopolitical asset. In January 2009, Israel’s economy and international stature were transformed overnight when the Texan firm Noble Energy discovered gas in the Tamar field in the eastern Mediterranean. This field is estimated to contain 200 billion cubic meters (BCM) of natural gas. Tamar represents over half of what the European Union’s 28 nations consume annually. Two years later, in December 2010, Noble Energy discovered a huge gas field, which is now estimated to contain 500 billion BCM of gas. This second field was named Leviathan. The Tamar and Leviathan deposits are expected to provide Israel with enough natural gas for decades and transform the country into an energy exporter. The Tamar and Leviathan discoveries have already transformed Israel’s international standing and its relations with Egypt, Jordan, Turkey, Greece, and Cyprus. Natural gas resources also improved Israel’s relations with Greece, a country with a traditionally pro-Arab foreign policy and which only established diplomatic relations with Israel in 1990. In June 2017, Israel, Greece and Cyprus announced that they would cooperate for the construction of a pipeline linking the three countries and meant to deliver natural gas to the EU. Cyprus has its own large gas field (Aphrodite), and therefore a partnership between Israel and Cyprus can turn them into a mega gas exporter. Greece, for its part, has a weak economy and wants to be a transiting country for the export of eastern Mediterranean gas to the European continent. Israel started favoring its relations with Greece due to the deterioration of the Israel-Turkey relationship after 2010. Israel sees in Europe an important potential customer for its natural gas, not least because Europe tries to reduce its dependency on Russian gas. Yet building gas pipelines from Israel to Europe is logistically challenging. An overland pipeline would have to go through Lebanon and Syria, two war-torn and failed states with which Israel is technically at war. An underwater pipeline to Turkey is technically possible, but it would have to go through Cypriot territorial waters and thus get Israel involved in the conflicting claims of the Turkish-occupied Northern Cyprus and the Republic of Cyprus in the southern part of the island. Cyprus will not allow a pipeline to Turkey through its territorial waters until there is an agreement on reunification of the island. Cyprus has its own gas fields and it is interested in a partnership with Israel for export to Europe. Yet Turkey is opposed to such a partnership unless Turkish Cypriots also benefit from it. A partnership with Egypt was unthinkable when the country was ruled by the Muslim Brotherhood between 2012 and 2013, and it might still be risky due to Egypt’s political instability. Yet the “Egyptian option” should not be ruled out. Israel’s security cooperation with Egypt has been restored and expanded by Egyptian President Abdel-Fattah al-Sisi. 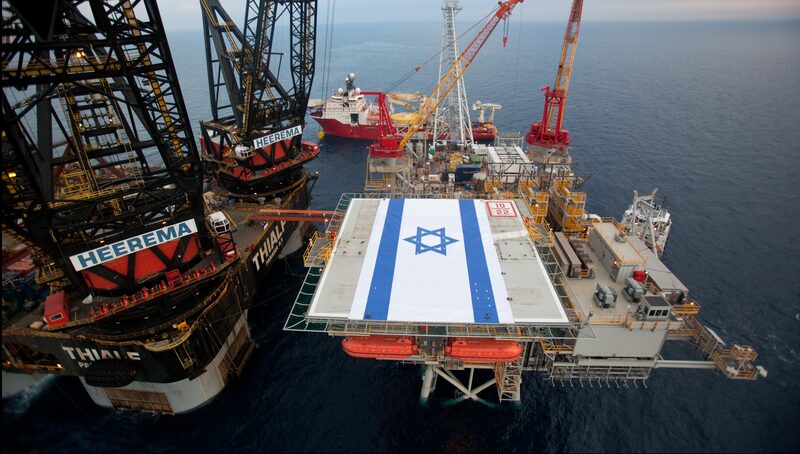 Moreover, Israel and Egypt have common interests when it comes to natural gas. Egypt also has large natural gas reserves. Its Zohr gas field, which was discovered off its northern coast in 2015, is the largest in the Mediterranean (it is nearly twice the size of Israel’s Leviathan). Yet because Egypt has 95 million inhabitants and a high population growth, it needs its natural gas for domestic consumption. Indeed, Egypt will likely need to import natural gas to meet its needs even after Zohr becomes operational, and those needs can be met by Israel’s exports. It would make sense for Israel to develop an energy partnership with Egypt because Egypt has two natural gas liquefaction terminals, via which Israel could export LNG to Europe (Israel doesn’t have such terminals). There are signs that an energy partnership between Israel and Egypt is taking shape. In August 2017, the Egyptian President signed a law that allows private companies to import natural gas. An Egyptian energy firm, Dolphinus Holdings, is already negotiating with Israel’s Leviathan. Israel can build its own LNG terminals. Until such terminal are built, however, Israel can use Egypt’s. In October 2013, the Israeli government approved an ambitious railway project that will connect the Red Sea port of Eilat to the Mediterranean port of Ashdod. Such railway could be used, together with the Suez Canal, to export Israeli LNG from the Mediterranean to Asia. So far, this monopoly has been broken only in isolated cases. Brazil set-up a large-scale sugar cane-based ethanol industry in the wake of the 1973 oil embargo. Today, most Brazilian cars have engines that can run on both petroleum and ethanol (gas stations in Brazil offer the two options to their customers). Sugar cane-based ethanol is not the only biofuel available on the market. Research has produced over the years “second generation” biofuels based on non-consumable crops, organic waste, and algae. As opposed to countries like China, the US or Brazil, Israel cannot compete with the massive production of biofuels. Israel can theoretically produce biofuels in Sub-Saharan Africa, but doing so is a challenge in terms of logistics, distance, and funding. Rather, Israel’s comparative advantage lies in its technological edge. Israel has world-renowned researchers who specialize second-generation biofuels and other technologies that can produce alternatives to petroleum. Israel has an interest in contributing to the progressive dethroning of oil’s monopoly in transportation. In January 2011, the Israeli government decided to launch an ambitious multiyear program whose goal is to promote “technologies to reduce the global use of oil in transportation.”18 This program includes generous funding for scientific research, incentives for investment in local companies developing oil alternatives, a scheme for implementing these alternatives in Israel as a preliminary application site, and cooperation with multinational organizations and countries seeking to reduce oil dependency, such as China and India. Israeli technology also has a contribution to make to the energy transition required by the Paris Agreement and implemented by Germany’s ambitious Energiewende(energy transition). Germany’s 2010 legislation on energy transition requires that the country produce 60% of its energy from renewables by 2050. Renewable energy sources (such as wind and solar power) only produce 7% of the electricity generated worldwide.26 Expanding the share of renewables in electricity production will largely depend on reducing the cost of renewable energies thanks to further research and development (R&D). There are about 270 Israeli companies that operate in the field of renewable energies, and many of them are world leaders.27 The contribution of Israeli technology to the economic viability of renewable energies can be boosted by a government program similar to the one that had been approved in 2011 for the reduction of the use of petroleum in transportation. Israel’s “oil problem” has turned into an asset, but one that can and must be fully leveraged thanks to wise and proactive policies. Israel should promote the construction of pipelines both via Turkey and Greece, sign long-term supply contracts with Egypt and Jordan, and develop the export of LNG. It should also make full use of its technological innovations in renewable energies to help leading economies meet the requirements of the Paris Agreement and to accompany Germany in its Energiewende. Israel’s energy policy will also need to manage risks. Those include political instability in Egypt and Turkey (hence the need for diversification), and the “Dutch disease” (the appreciation of the natural currency resulting from the massive export of natural resources). The mutation of the energy factor from liability to asset in Israel’s foreign policy is no less than revolutionary. Energy markets are admittedly unpredictable. Oil prices might stabilize and even surge again, and new natural gas discoveries in the Mediterranean Sea might relativize Israel’s market value. Despite the uncertainties inherent to the global energy market, however, Israel’s status as a powerful player is now recognized by its allies and foes alike. Liam Denning, “The Day After Energy Independence Day.” Bloomberg, 29 March 2017. United States Energy Information Administration (www.eia.org). “The Future of Oil.” The Economist, 26 November 2016. “U.S. emerging as powerful force in LNG trade.” E&E News, 9 August 2017. “The Rapidly Expanding Global Liquefied Natural Gas Market.” Forbes, 9 July 2017. “Israel Quietly Begins Exporting Natural Gas to Jordan Amid Political Sensitivities.” Ha’aretz, 2 March 2017. “Turkey’s Rising Natural Gas Demand Needs U.S. LNG.” Forbes, 7 February 2016. “Turkey-Israel natural gas deal important step for regional stability.” Daily Sabah, 27 April 2017. “Turkish energy minister to visit Israel for pipeline deal.” The Times of Israel, 12 July 2017. “Israel signs pipeline deal in push to export gas to Europe.” Financial Times, 3 April 2017. “Israel has a gas conundrum.” The Economist, 17 August 2017. Key World Energy Statistics. International Energy Agency (2016), p. 24. Eugene Kandel and Netanel Oded, “Staring Down the Barrel: Israel’s Oil Problem.” Azure 45 (Summer 2011), p. 42. “The death of the internal combustion engine.” The Economist, 12 August 2017. “The coming revolution in transport.” The Economist, 24 November 2016. “After electric cars, what more will it take for batteries to change the face of energy?” The Economist, 12 August 2017. “Peugeot tests Israeli range-extender technology in electric car push.” Reuters, 13 July 2016. “This Israeli Car Battery Can Charge in Five Minutes.” The Jerusalem Post, 18 May 2017. Abigail Fagan, “Israel Tests Wireless Charging Roads for Electric Vehicles.” Scientific American, 11 May 2017. “A world turned upside down.” The Economist, 25 February 2017. “Israel Gears Up to Forge Renewable Energy Nation.” Ha’aretz, 27 November 2015. Previous articleShould funding to UNRWA be made conditional on ending incitement? Next articleWho Saved Israel in 1947? Another very useful weapon neglected by the state of Israel in the energy war and massive petro-dollars that go with it, is the use of solar energy. Give me one good reason why Israel is not utilising these effective clean systems in their war against the Arab world?